Did you know that moon jellies, commonly called moon jellyfish, are not actually fish? These Pacific locals are free-swimming members of phylum Cnidaria, which also includes anemones and corals. They have a gelatinous consistency with no hard, skeletal body and their tissues are comprised of more than 95 percent water. Moon jellies at Birch Aquarium. Photo by Chad Creviston. 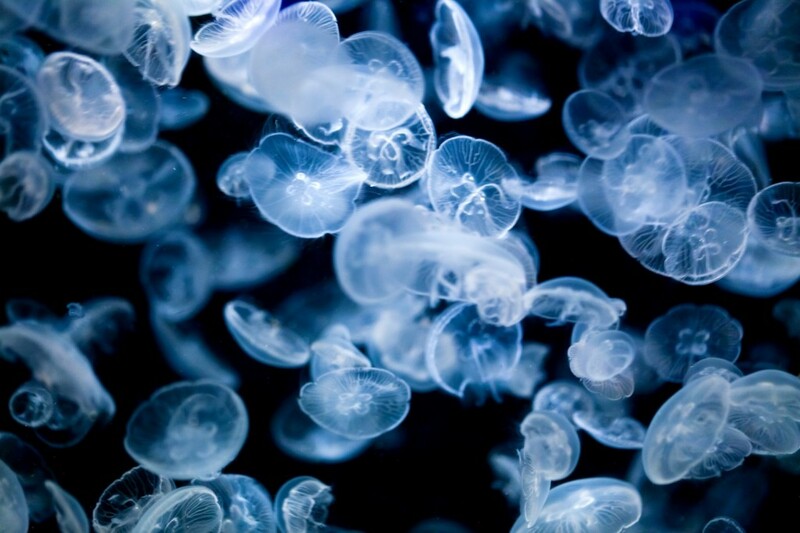 Moon jellies have no organs – brain, heart, kidney, liver, lungs, etc. – and can’t retain their shape if removed from their watery home. However, when their moving through water, their structure is very advantageous. Since moon jellies are easily carried by water movements, they don’t need to spend much energy on swimming. The largest part of their body is called the bell or “umbrella.” When not relying on water for movement, moon jellies propel themselves using muscles inside the bell called the subumbrella. When these muscles are contracted, water is pushed out and the jelly is propelled forward. The umbrella also contains special sensors that keep the jellies informed about where they are, changes in light, and what is around them. Moon jellies are one of the larger species of jelly, and their bodies are designed around a central axis. Along this axis runs a digestive cavity that opens to the outside through their mouths, which have four parts and are surrounded by four long lacey tentacles. In fact, several of the moon jelly’s structures exist in symmetrical groups of four. The next time you visit Birch Aquarium, look for four stomach rings in the middle of the bell. You might be able to see what they’ve been eating! Moon jellies feed mainly on zooplankton, including other jellies and small fishes that they encounter while drifting. Zooplankton refers to all animals that rely mainly on the movement of water in the oceans, seas, or bodies of fresh water to carry them along. As one of the larger species, moon jellies are considered a macrozooplankton. Once an animal sticks to the special mucus on the jelly’s bell or is stung by their nematocysts barb-like stinging cells that releases a toxin into whatever brushes against it), the moon jelly uses its tentacles to transport the food into its mouth. Though their tentacles contain a stinging toxin used for catching prey and as a defense mechanism, jellies can’t sting their own species. Come see eleven moon jellies drifting through the water this holiday season at Birch Aquarium at Scripps. Moon jellies are just a few of the 3,000 fish and invertebrates that thrive at Birch Aq uarium at Scripps. By adopting one today you can be part of the tea m that provides essential care to these special ocean inhabitants. 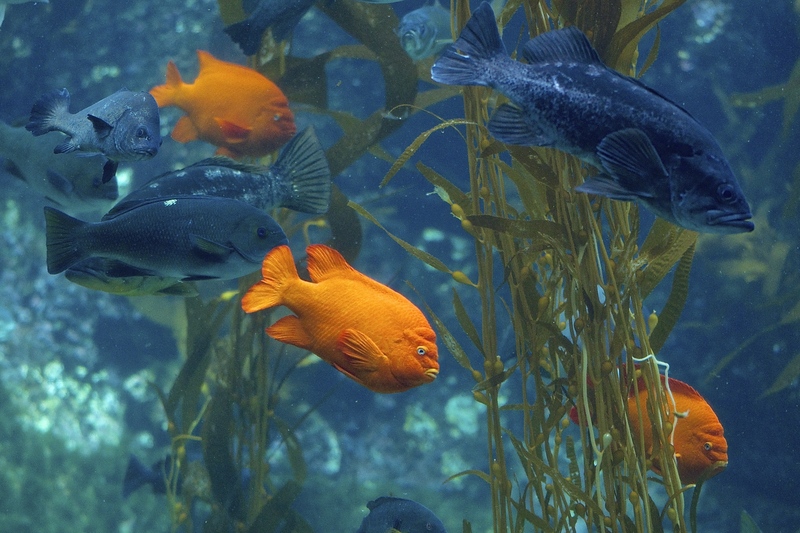 Find out more about the Aquarium’s Adopt-a-Fish program. Beautiful image of Jellies at the aquarium! Thank you so much for pointing out they are Cnidarians and not fish. Sea stars and Jellies aren’t fish and it’s great to share this with more people. Nice post.